Which breeds make good service or guide dogs? Posted by Cyril. September 5th 2015. You may think service and guide dogs are a relatively recent concept, dating from early in the 20th century, but they actually have a history which stretches much further back to ancient times when they were used as trackers and patrols in times of war. The earliest documented use of a dog in warfare happened in around 600 BC, but the Greeks and Romans were big advocates of our four-legged friends and used them extensively. Nowadays, the work which dogs undertake has changed dramatically and, with September marking the start of National Service Dog month – formerly known as Guide Dog month, we take look at the five breeds which are perfectly suited to carrying out vital roles in the 21st century. Golden Retriever: With a friendly attitude and high level of intelligence, this breed is perfect as a guide dog for the blind and in its more recent role as a hearing dog. Superb at tracking, agile and boasting a competitive obedience which is second to none, they are ideal partners for owners with a diverse range of needs. German Shepherd: Intelligent and courageous, this breed’s versatility means it has become synonymous with the military and as a police dog. Obedient and faithful, the German Shepherd will excel at almost anything they are trained to do, making them perfect allies for servicemen and women around the globe. Labrador Retriever: Originally used to help fishermen haul in nets and retrieve fish from the North Atlantic Ocean, they have developed over the years into guide dogs and search and rescue dogs. Friendly, good-natured and hard working, this breed is also used as a diabetic dog and make great family pets too. Miniature Poodles: Having first come to light in the 17th century as dog which retrieved game fowl out of rivers and lakes, this breed is very intelligent and loves to learn. 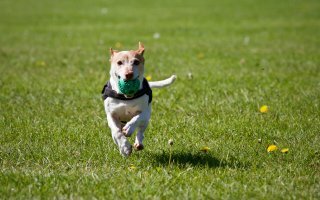 In recent years, they have been turned into companion dogs, with their playful and energetic nature meaning they are well-suited to their role as hearing dogs because they will happily adapt to any situation. 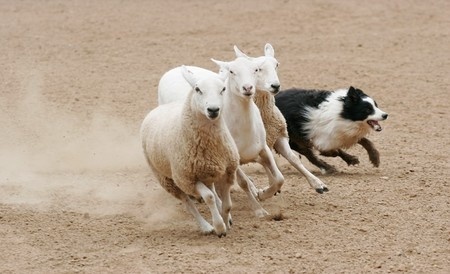 Border Collie (pictured below): Bred to control and round-up sheep in Scottish borders, they are known for their unlimited energy and stamina, which means they are now used as search and rescue dogs. A first class herding dog, with an intense stare to control even the largest flock of sheep, this dog is used on farms around the world because of their obedience. 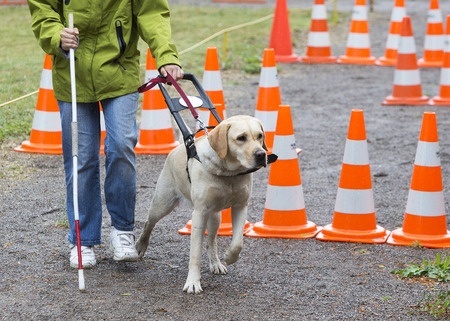 Whilst the Golden Retriever and the Labrador Retriever are probably best known as the most successful guide dogs, that does not mean other breeds are not utilised as guide dogs. The main requirement for a successful guide dog is that they are confident, friendly, intelligent and willing to work hard. The national Guide Dogs breeding program is currently trying to use Flat Coated Retrievers, Curly Coated Retrievers, Collies and Poodles so they can create guides which shed less hair so they’re more suitable for clients with allergies. Hearing Dogs for Deaf People, which was founded 30 years ago, are increasingly looking for any sort of breed as long as the dog is willing to perform functions which their individuals with a disability can’t do. This could be alerting people with hearing impairments, pulling a wheelchair or picking things up for an owner with mobility issues.